Transgressing oneself and becoming a Super Saiyan is triggered by an event of incredible despair and anger. In the moments leading up to the change, the eyes become unfocused and the body rattles like an earthquake is welling up inside – after which, the transformation occurs like an instantaneous maelstrom of energy! Supposedly, one must have a power level in the multi-millions beforehand, and also have a pure heart (good, evil, or otherwise…) during the time of transformation. The power increase is relatively unknown, as it depends on the Saiyan, and how much training they have undergone. Visual changes:- The hair turns deep gold; flows upward into thick, slanted spikes; bangs tend to hang down over the face and sides of the head. - A complete black border is inscribed around the eyes, giving a much more focused and “mean” look. The pupils turn to a deep green. - The aura is a steady, form fitting flame of pure white that encompasses the body at all times. - For Saiyans whom haven’t come far in bringing the best from their Super Saiyan forms, a state of great ferocity and ecstasy overcomes them. - This is the only Super Saiyan transformation that requires rage or any sort of powerful emotion to unlock, as the rest are brought about by training. - Through rigorous training, a Saiyan can bring himself to a point where Super Saiyan is his natural state. In this manner, he relieves the state of ecstasy normally accompanied by the change. No aura is displayed in this “stage”. - When a Super Saiyan either brings himself to a point where transforming bring no strain upon himself or makes the stage his natural state, their full power aura undergoes a change in which it becomes larger and more vibrant (the hair may also become slightly more elevated). This also marks the point in which the Saiyan has truly mastered the power of the Super Saiyan – far surpassing the “Super Saiyan type 2” and “Super Saiyan type 3” stages outlined later in this guide. to transform into a super sayian level one type one it requires 10000 experiance points so therefore everyone can start out as a super sayian BUT requires one post ipf intense training first. This transformation has no roots in rage – but is brought about by extensive training and control over the state of Super Saiyan. Turning into this state resembles that of an extensive power-up sequence, in which the aura rages uncontrollably and is finally finished with a great flash of light, with a transformed Saiyan at the center. - The hair spikes further on end and is more defined. - The aura for this state is rough, and much more vibrant than that of the previous level. Extra Detail(s) –- Based on what little we see of this form, it seems the user tends to rely on single-hitting strong attacks, and much less on rapid attacks. This may or may not be a side effect of the extra bulk presented in this state. A state the pushes even further beyond the Super Saiyan type 2, taking everything to an even greater level. Conditions to meet in order to transform are the same as the previous stage, but for a longer period of time. Transforming is a much longer process than before, and causes an earthquake as though the planet fearful of the power soon to be unleashed. During this, the pupils may disappear, returning once the transformation is complete. Visual Changes (From the Super Saiyan type 2) –- Each hair strand becomes very large and juts out extremely far. - The aura is very wild and all over the place, and tends to branch off in random directions like a massive surging ball of electricity. - Muscle mass increases even further, to well over twice the size as the original Super Saiyan. Extra Detail(s) –- Because of the incredible increase in muscle mass, the Saiyan finds himself incapable of moving in any sort of fast or fluid manner, leaving them completely useless against an opponent with any kind of speed. Theoretically, this stage would be extremely effective against a large group of much weaker opponents. requirements for Super Sayian level one part two is 15000 Experiance and for Super Sayian level one part 3 is 18000 Experiance. The first true transformation beyond the original state of Super Saiyan – this stage is not so common as its predecessor(s) and sets an entirely new standard for the way battles are fought. Gohan unlocked the ability to tap this power in the Room of Spirit and Time, but held himself back for a number of reasons. It isn’t until the Cell Game that it is finally forced out of him. Based on this, along with Goku and Vegeta’s eventual following in those footsteps, it can be concluded that this stage is unlocked simply through training and completely mastering the state of Super Saiyan. Visual Changes (from the Super Saiyan) –- The hair spikes stand as far upward and on end as possible, with the occasional tendril hanging down in front of the Saiyans face. - The aura holds itself very far out from the body, a further extreme of the Aura of the type 2 Super Saiyan. Most unique is the thick bolts of lightning that surge all over the body constantly. Behold the Ultimate Super Saiyan!!! This transformation marks the end of the progression of Super Saiyans, and is the greatest culmination of Saiyan power when naturally realized. Only 2 warriors every unlocked this state, one of which is a fused warrior. This is also the only Super Saiyan stage capable of matching up against the series’ final central antagonist – Majin Boo. 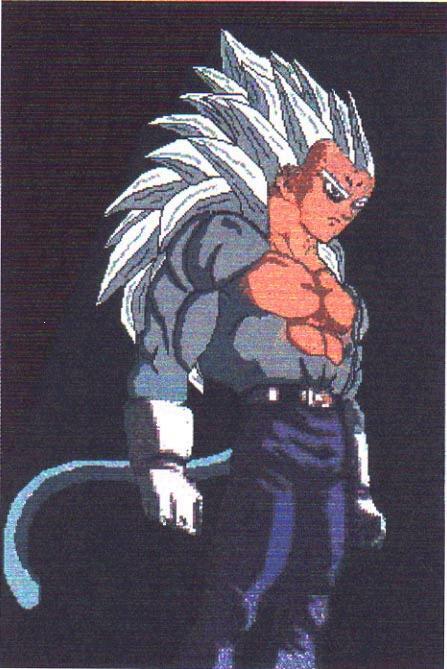 Visual Changes (from the Super Saiyan level 2) –- The hair grows several times in length, down to the back of the waist or knees (depending on users own height). - The aura closely resembles that of the Super Saiyan level 2, but the border almost seems to meld right into the air itself from time to time. - The eyebrows disappear completely, giving the Saiyan a face that may somewhat resemble that of a Namekian. Extra Detail(s) –- The demand of Ki required to tap the awesome power the Super Saiyan level 3 makes it so that it can only be freely used in the afterlife. When used in the living realm, it causes the user to either borrow against time before returning to the netherworld, or completely drain oneself of all power after just a few minutes of transforming. It may well be impossible to access the full power of this state in the living realm. For fused fighters, this stage can be used freely, but with a time limit of 5 minutes. requiremenets for transformation of Super sayain 3 is 200 posts and a experiance reading of 45,000.
the ultimate power level for all sayains.- most sayians cannot achive this level f power due to it being unlocked only by someone who is a warrior with years of experiance. the power of this stage can destroy even the most powerful of foes with the least bit of power used in this stage. the hair countinues to grow as it does in SS3 but instead it stops at the waist line and points everywhere simular to super sayian level one type three. the eye line redens and the eye color turns into a deep gold. 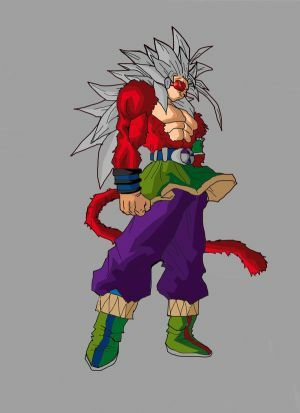 also the user gains fur around the arms and regrows a tail that all sayians are born with along with slightly increase muscle mass. -the power levels of this stage are massive and requires insane levels of concentration, training, and experiance to even begin to reach this stage. little is known about this stage when mastered but other than that only the strongest of sayians can even begin to understand the form. ready? requires 400 posts and 85,000 experiance level reading before able to reach the stage. Is SSJ5 a real one? I know its not canon and its only in DB AF. Which isn't a canon show, but would SSJ5 count as a SJJ? Wouldn't Baki have replied with yes? Baki personally asked me to be an Admin for him... He didn't say it and I was online, So I did you a favor by answering your question earlier than he did. Is that a problem? Oh no, thanks . Is Baki gonna put the requirements for SSJ5? Why? 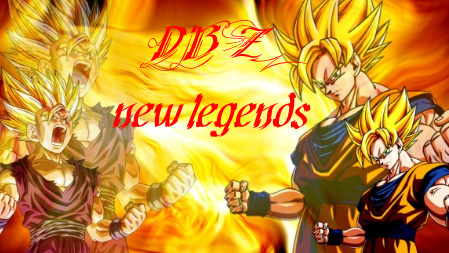 The site clearly says DBZ:the new legends. not dbaf. (unless you guys skip some sagas/plots or whatever and suddenly reach DBaf. Its kinda like that. Its been a long time since the Z fighters were alive here, so I think they would have skipped SJJ5. SSJ5 is often argued over in alot in a few DBZ sites and its form is often argued over for example some groups belive SSJ5 to have white hair and look like a mix of 3 and 4 and others belive it to be other stuff. BUT later if alot of people reach SSJ4 and want SSJ5 ill make it happen. I personally dislike SSJ3 and up, so I'd rather not have any more unnecessary transformations , but that's just my opinion. Is there going to be a false Super Saiyan and Super KAIO - KEN? False Super Saiyan is far easier to achieve but is way weaker, its also called ' Glorified KAIO - KEN '. The user looks like their in KAIO - KEN but their hair stands on end and turns red, their skin tone turns tan. Super KAIO - KEN is a mixture of SSJ and KAIO - KEN, it was used by Goku in the otherworld tournament.